Exercising your dog is one of the standard aspects of dog-owning. All dogs need exercise, but owners are often uncertain about how much their particular dog needs. The quick answer to this question is that the amount any dog needs depends entirely on the dog. All pet owners and their animals live drastically different lifestyles, and have drastically different eating habits, so the quantity and length of the dog walks you take necessarily changes widely according to the particular circumstance. Luckily, however, there is an approximate way of determining how much exercise your dog needs, regardless of the uniqueness of you and your pet’s lifestyle: their breed. Yes, that’s right: knowing your dog’s breed can go a long way to determining the amount of exercise they need. This is because different breeds have different exercise requirements. In fact, different breeds are as unique as fingerprints with regards to the specifics of their care. Grooming, the kind of food you feed them with, and medical care are all impacted by the breed of dog. A labrador retriever is just a longer name for a labrador. It is not, as is often assumed, a mix between a labrador and a golden retriever. This breed got its name from where it originates: a province called ‘Labrador’ in Canada. However, experts debate about the specifics of the origin of the labrador, including how it actually came to be its own defined breed. It is generally agreed that the labrador breed developed out of indiscriminate interbreeding between the St. John’s water dog and other settler breeds of mixed origin including Portugese. 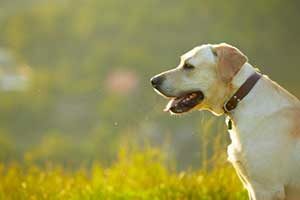 The labrador retriever gets its name partially from the kind of work its ancestors did. The line of dogs it came from were involved in fishing tasks: carrying fish, pulling rope, and retrieving fish nets from the water (hence the ‘retriever’ part of the name). The short hair of the St. John’s dog made it better for such tasks, because the conditions were often very harsh and icy, and ice got caught on the longer-haired breeds. Because of their heritage, labradors are a high energy breed. They need approximately one hour of exercise every day. If you have a labrador who is exceptionally hyper, they need more to calm them down. A labrador of friendly temperament needs one hour, a hyper one needs 1.5 hours, and if your lab is very placid and relaxed forty-minutes will do the trick. You should also give or take a bit of time according to their health or age. Obviously, if they’re an older dog with poor mobility, their exercise needs change dramatically, and it is recommended that you don’t over-exert them in such cases. Number two on the list of America’s most popular dog breeds is the German shepherd. Obviously, this breed originates from Germany, but its history is very complex indeed. Max von Stephanitz is the German credited with the discovery of this breed because of his work with in-breeding. His discovery was accidental in part: the first dog that was in-bred to become what we now as the German shepherd was found by Stephanitz at a dog show. He changed the dog’s name to Horand and made him the centre point of his breeding programs. Stephanitz’s vision for dog breeding was to breed a dog specifically for working. There is a degree of controversy surrounding the breeding habits of German shepherds nowadays, particularly with regards to the health and posture of the dogs. Critics of today’s breeding standards lament that Stephanitz managed to filter out health defects in the breed, and now there are not enough regulations in this area. There is also some negative commentary surrounding the unusual posture of German shepherds used as show dogs: their back is somewhat slanted compared to those who are bred to be working dogs, and this difference has met with much criticism. 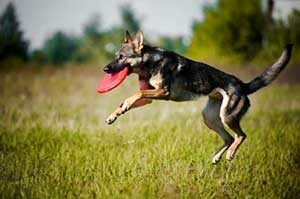 The breed characteristics of the German shepherd mean that it needs a high level of exercise. Their breeding history as working dogs mean that they are incredibly active and need entertainment. Exercising a dog is primarily for their health, but it is also connected to their behavior. In order to provide the optimal conditions for a healthy German shepherd, you should introduce vigorous daily exercise into their routine. Physically active people will love going out for a long run with their dog every day. Those who live a more sedentary lifestyle may find it difficult to keep up with the energy needs of the German shepherd. For many years it was thought that golden retrievers were the desired result of breeding Russian circus dogs with bloodhounds. Lord Tweedmouth, a member of the English gentry, was responsible for breeding. However, after further research, it was found that golden retrievers were the result of breeding between an unregistered yellow retriever and tweed water spaniel (a now extinct Scottish breed). This is the currently accepted theory regarding the origin of the golden retriever breed. Their history as a breed portrays the golden retriever as an excellent tracker, sniffer, and hunter. In contrast to the labrador retriever and the German shepherd, the golden retriever is a bit less active, because their working history is not as high-energy as the others. This friendly placid breed is well known as a perfect family pet, even for families with very young children. The standard traits of the golden retriever breed show it to be a very calm and laidback dog: even the unwanted attention of young kids who don’t know how to handle a dog properly will likely gain little to no reaction from this incredibly docile creature. The exercise needs of the golden retriever are determined by examining other parts of its history as a retrieval dog: in the 19th century, they were often used to retrieve game caught by hunters. Thus, the golden retriever is an agile breed with an affinity for water. The perfect way to exercise your retriever is to give it something to retrieve: that’s right: balltime! Playing ball with your retriever every day for at least an hour should suffice. This breed has an affinity for water, too, so if you live near a body of water, don’t be surprised when your dog loves to jump around and splash in it! Anyone can spot a bulldog when they see one: their look is very unique to other dog breed. The origins of a bulldog are complex, and widely debated. However, it is generally thought that bulldogs got their name from their traditional job of guarding, baiting, and chasing bulls. Bull baiting is when a bull is held in position by its nose and rendered helpless. Bull baiting was not only a form of entertainment, but also a superstitious method of preparing a bull for slaughter. Baiting the bull in such a manner was generally thought to improve of the tenderness of the meat. 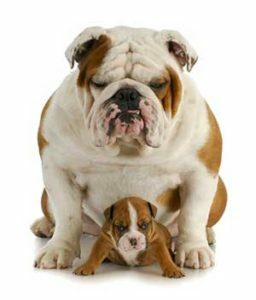 Bulldogs are often wrongly assumed to be aggressive because of their odd appearance and the history of their breed. However, in reality, this is a very laid back breed, known for its gentle disposition and overall laziness. The lazy nature of this breed doesn’t mean they shouldn’t be exercised. However, bulldogs generally don’t require as much exercise as other dogs. A fifteen minute walk around the block or down the road every day, at a leisurely pace, is usually sufficient exercise for a bulldog. Now that some of the exercise needs of the most popular breeds has been assessed, it’s important to remember that there is no one-size-fits-all approach to ensuring dogs get the level of exercise they need. As a general rule, however, just remember this: a tired dog is a good dog. Live by this philosophy and you won’t go wrong.